Kyle Reina/Contributing Photographer Video Games Live brought popular soundtracks to the Broome County Forum Theatre. 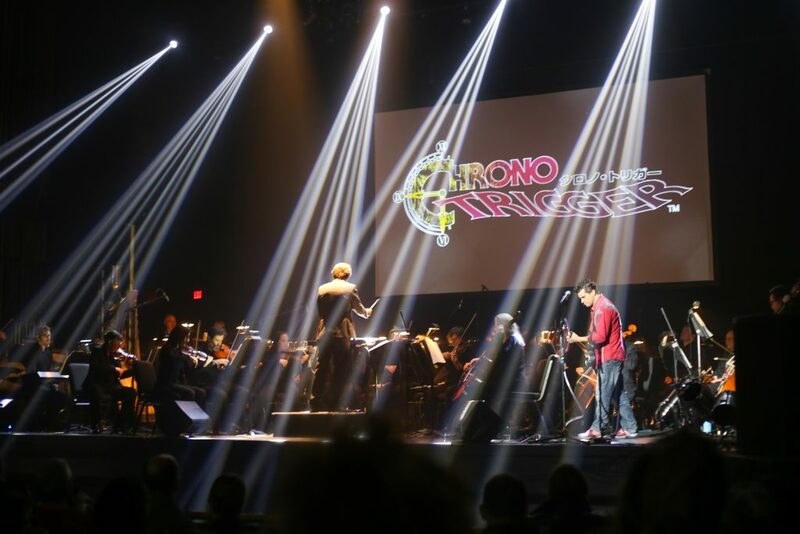 The show, held at the Broome County Forum Theatre, was created by video game music composer Tommy Tallarico and composer Emmanuel Fratianni, who orchestrated both the Binghamton Philharmonic Orchestra and Binghamton University’s own Harpur Chorale, a student-based choir group. The two groups worked together to produce each song throughout the show. Tallarico, who has been in the video game music industry for almost 30 years and holds two Guinness World Records for the most video game concerts performed and the largest audience for a live video game music concert, led the performance with his speeches and energy. He was not afraid to breathe his personality into the show as he included some personal pieces, such as the soundtrack for “Earthworm Jim,” his favorite soundtrack to compose. Tallarico’s performances were based around the sounds of guitars, as he switched between electric and acoustic. Brittany Hall, executive director of the Binghamton Philharmonic, said the show tries to engage with the audience members in a more personal tone than what is usually expected of orchestras. Each song was accompanied by gameplay footage from the game, providing audience members who might not be aware of some games with context, as well as a visual aid to the music. In between songs, Tallarico included humorous skits that interjected laughter into the performance. One skit highlighted the 10 worst voice acting productions in video games, which were full of sexual innuendos, appealing to the older members’ humor. Tallarico amped the audience’s excitement for the finale by teasing the end of the show, only to break out two last songs. One was “Chrono Trigger,” a 1995 classic developed for the Super Nintendo Entertainment System (Super NES). The true finale of the show commenced with a guest appearance by Jason Paige, the singer behind the original “Pokémon” theme song for the television adaptation of the series. Paige electrified the theater with his performance of the song, especially since “Pokémon” is a series that has captivated gamers for the past 20 years. Paige said that his favorite part of the show was signing autographs afterward and hearing the stories of fans who were moved by his performances.